Developers in China have found the perfect solution for the tedious rush hour traffic of each day. Just like the old sayings, if you can’t go around it, go OVER it! That’s right, they’ve designed a new bus that could actually let cars 2 meters or less drive below it as it passes by overtop! This design is being created by Shenzhen Huashi Future Car-Parking Equipment actually looks pretty promising! It’s almost a train looking design with passengers on the top floor of the Bus leaving a large gap between the ground and it for cars to drive by! 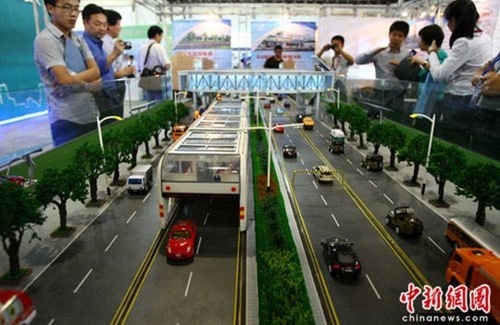 (Hooray for no more annoying stopping as you’re stuck behind a bus picking up passengers on a busy route) They plan on beginning construction of its first 186km track at the end of the year in Beijing’s Mentougou district! You can see a video of it in action at the source link! Better book your flight now!